Glass is such an incredible art medium. 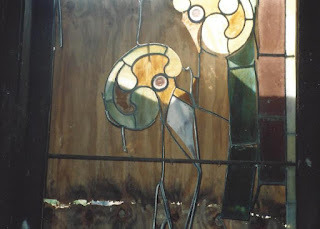 In this blog, I want to explore and share all kinds of art made with glass...from stained glass windows to fused glass, slumped glass, and, my new favorite, blown glass. It is absolutely amazing what beautiful art can be made of glass! Never judge a book by its cover. That’s what popped into my thoughts the day I walked into the Tifton Museum of Arts and Heritage. I had gone there for a meeting and, being new to town, had no idea what to expect. The outside of this building is made of rather plain looking red brick. The roof angles are interesting, but this didn’t give any hint to the treasures inside. I walked up the steps to the wooden front door and opened it, expecting the interior to be as common and conventional as the outside. Boy, was I surprised! While the exterior of the building was rectangular, the interior space was octagonal! 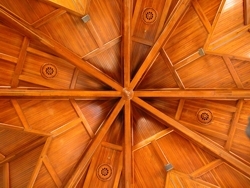 My gaze traveled across the beautiful wooden floors and then upward toward the spectacular wooden beams and arches in the domed ceiling. 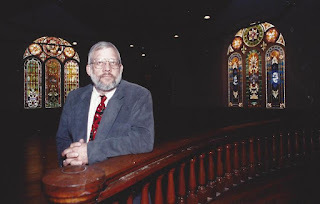 As I stood in the center of the room, I became aware of the amazing colors flooding into the room through the spectacular stained glass windows all around me. I found myself speechless at the unexpected beauty inside this unassuming Tifton treasure. I caught up with the local architect, Roy Rankin, who oversaw the renovation of the building in the late 1990s and borrowed his whole file about the project. This brick structure was built in 1901 when using brick was virtually unheard of in Tifton. 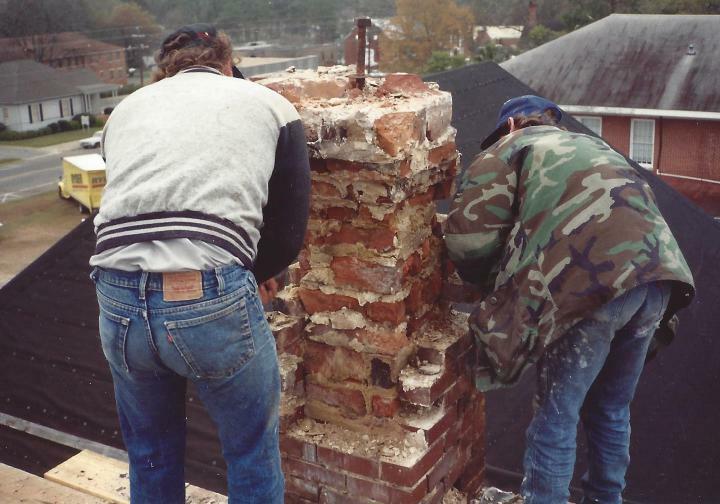 The go-to construction material of the day was wood, but wood burns easily and the local hooligans and saloon regulars in downtown Tifton wanted to keep their party area of town church-free, so they burned down any wooden churches that were built in that area. Nevertheless, the tenacious and determined Methodist congregation wanted their house of worship right there amongst the sinners, so they decided to build a brick building that couldn’t be burned down. Captain Henry Harding Tift, brother of Nelson Tift who founded the nearby city of Albany, donated a lot on Love Avenue plus $2,000 to the congregation for their new church building. 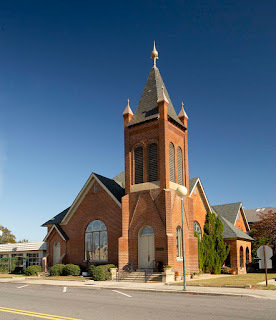 The contract for the construction of the Gothic Victorian style church was awarded on March 14, 1901, to a builder named Mr. J. C. Blackburn of Valdosta, Georgia, for the unbelievably low construction price of $5,000! The cornerstone for the building was laid on April 23, 1901. The heart pine used for the beams, walls and flooring came from the neighboring pine forest rich town of Fitzgerald. The beautiful stained glass windows were part of the original design and construction. 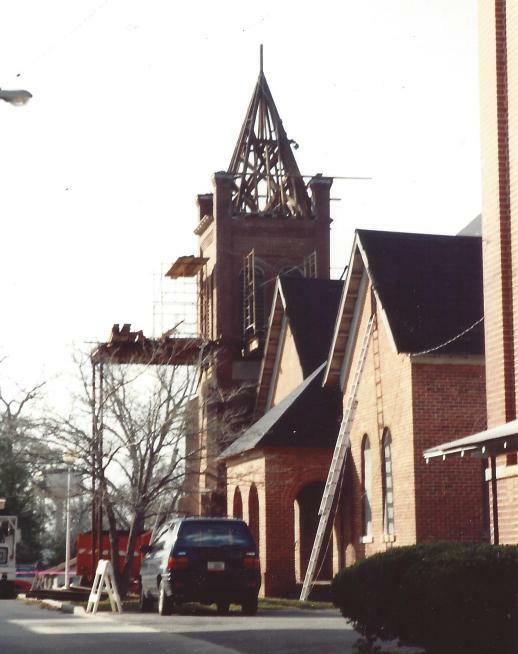 During construction, church members took turns guarding the building. They successfully thwarted three attempts by ruffians to destroy the building. 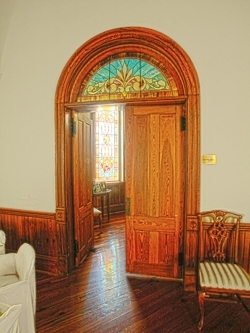 According to the walking tour brochure entitled “Living in a Landmark: A Guide to Tifton’s Historic Buildings and Districts,” this building was once considered “the finest church in the South.” When it was built, the main interior room, a spacious octagonal-shaped area, had beautiful heart pine floors, walls and ceiling. Skilled ship’s carpenters, or joiners, who were hired by Captain Tift, handcrafted all the woodwork. Enormous arched beams were built to support the grand vaulted ceiling. A reverse finial was set at the center point where the beams met. In the attic above the vaulted ceiling, huge timbers were crafted and installed to give additional support to the arches. Each plinth block in the corners of the molding around each window and doorway was hand carved with an intricate medallion or bull’s eye pattern. The bell tower on top of the building was designed and built to house a working bell to call people to worship. On top of the bell tower was a beautiful brass finial. By about 1950, the Methodist congregation had grown too large for the red brick building on Love Avenue, and construction was begun for a larger facility not far away on the corner of 12th Street and North Central Avenue. Once the congregation moved to their new larger church home, the little red brick church building sat unused and empty for forty years. As often happens to abandoned buildings, vandals broke in and caused havoc and destruction to the wood floors and walls in the beautiful old church building. Sadly, but not surprisingly, the majestic stained glass windows were horribly damaged too. Bats took up residence in the attic. Pigeons, rodents, and insects added to the mess as they made the old church their home. Fast-forward to 1994 when Clay Dorminey, President of the local Rotary Club, felt duty-bound to save this piece of Tifton’s history. Rumor had it that someone had purchased the old church and planned to demolish it and build a convenience store in its place. Mr. Dorminey formed a task force to research how to save the building. This task force morphed into the Tifton Museum Board as the members worked to gain county commissioners’ approval to renovate the building and restore it for the community. The Board spent a year trying to determine the extent of the damage to the building, what it would take to restore it, and what the future use of the building would be. Once the Board decided that the best use for the renovated building would be as a museum and gallery, they began to search for the funding needed for the project. Bob Ragsdale, a local City Councilman, paid $125 to purchase the legal right to prevent the county from destroying the building. Then Tift County Development Authority intervened. The Development Authority purchased the old building from the county with the understanding that they would lease it to the Museum Board. The agreement was that the Board would pay for all renovations to the building. Syd Blackmar, an active and determined Board member, wrote a grant application to The National Endowment for the Arts for the project. The grant was awarded that same year in the amount of $125,000! As agreed, Tift County matched these funds 2 to 1 with SPLOST funds. The $375,000 would get the renovation started, and donations from the people of the community would take the project to completion. All total, almost $500,000 was raised for the renovation. As destiny would have it, the architect who was selected for the renovation is the great-grandson of Henry Harding Tift. Roy Rankin, a Georgia Tech architecture graduate, accepted the project as a challenge as well as a labor of love. To restore the old church building to its original glory would show great honor to his Tift family heritage. 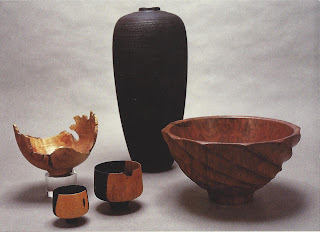 October 1995, the project began. 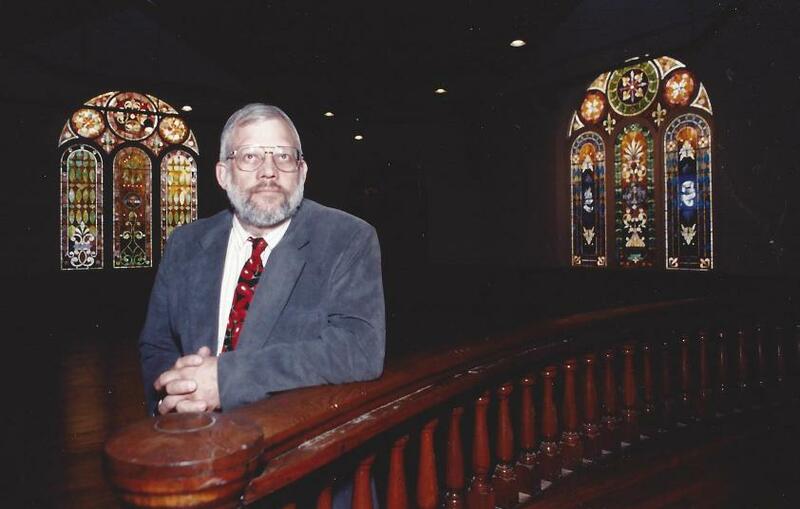 Roy Rankin oversaw the 18-month long process. According to Roy, the building had deteriorated even more by the time the project actually began. Weather, termites, animals and time had taken their toll on both the interior and exterior of the structure. The slate roof was a caved-in disaster and needed to be completely replaced. 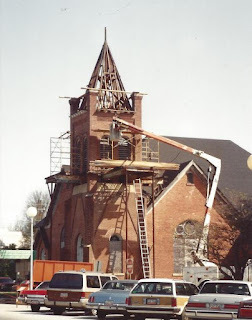 The steeple and bell tower were rotten and falling down and needed to be specially refabricated. The bell was rusty and dirty and needed major restoration and cleaning. The huge wooden beams and supports inside the building were eaten up with termites. It was an architect’s dream and nightmare all at the same time. 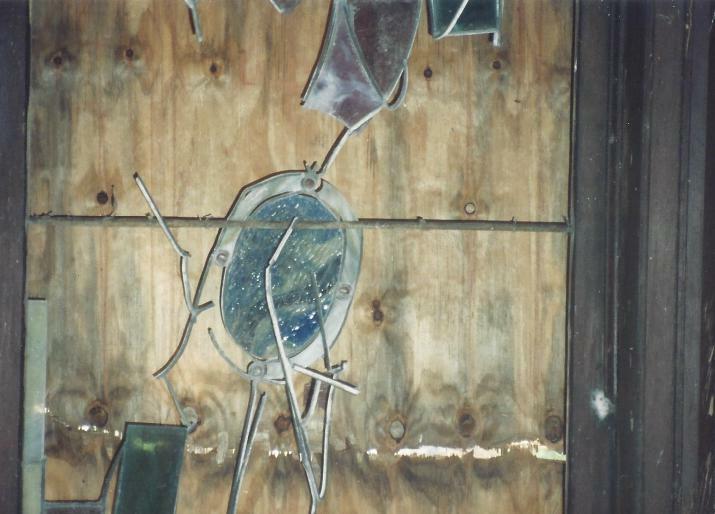 The stained glass windows were equally destroyed. Chuck Ale, stained glass artist and owner of Florida Stained Glass in Tallahassee, Florida, was the lead man for the renovation and restoration of all the stained glass windows. His co-worker, Chuck “Mac” McVoy, was very instrumental in the project as well. With the restoration of the stained glass windows being so crucial to the success of the renovation project, I decided to drive down to Tallahassee to talk to Chuck and Mac. The contract with Florida Stained Glass for the restoration of all the stained glass windows was signed in September 1995. 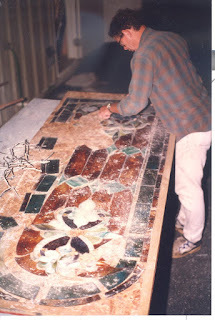 It was quite an undertaking for Chuck, Mac, and the Florida Stained Glass team. They had to first assess the damage, devise a way to remove the damaged windows from the church walls, and then transport the broken windows to their shop in Tallahassee. Once the windows were carefully duct taped and screwed down to sheets of plywood, they were trucked back to Tallahassee. In the shop, the glass artists unwrapped the windows one-by-one. They created paper patterns of the window designs by doing charcoal rubbings on the pieces of windows that remained. Once the rubbings were made, the glass artists were able to draw in the missing pattern parts of each window by copying identical and/or mirrored patterns in the glass remnants still intact in that window or in other windows. 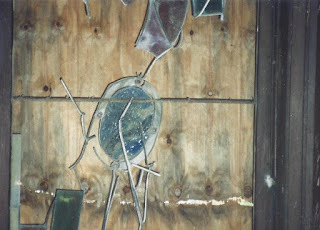 After photographs were taken of the existing damaged window pieces, Mac and his glass artist team took the windows apart. Each piece of glass was scrubbed with a special solution to remove the dirt, grime and glazing. Samples of each color of glass were selected and shipped off to the various glass manufacturers around the country. 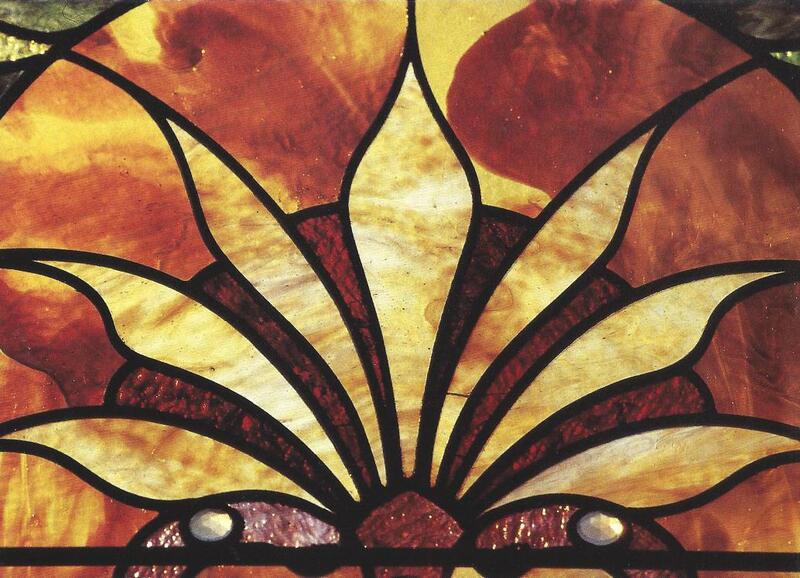 The best color and texture match was glass made by Kokomo Glass Company in Kokomo, Indiana. 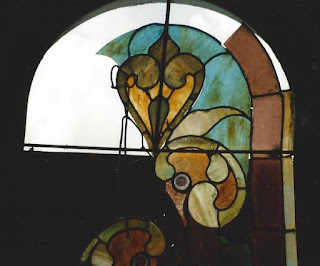 In particular, their opalescent glass collection called Mississippi Glass was the best match for the glass remnants in the Tifton museum windows. As the glass from Kokomo was manufactured and shipped to the Tallahassee stained glass shop, work on the restoration of the windows began. Piece by piece, the new glass was cut to add to the salvaged pieces of glass, and the windows were reassembled based on the patterns that had been drawn. The salvaged pieces of glass that were cracked were glued back together with a special UV glue made especially for glass. 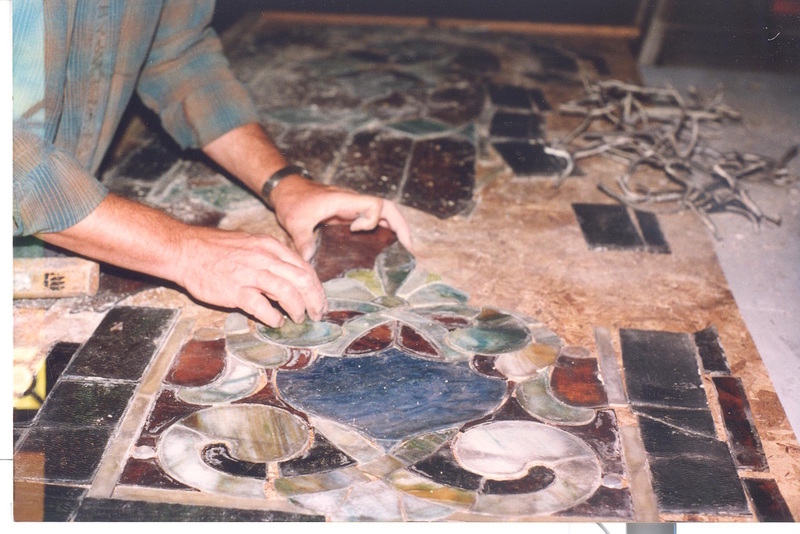 New lead was then installed to hold the cut glass pieces in place. New lead framing was also cut and soldered into place around each window as it was completed. It was rumored and even reported in the Tifton Gazette (“Renovating history in Tifton,” The Tifton Gazette. Wednesday, June 5, 1996, Section C, page 1) that the original windows were made in Italy. 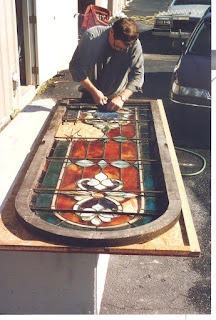 Chuck Ale doubts that this is true since the glass in the original windows was opalescent glass which was not invented until the late 1800’s in the United States. Louis C. Tiffany and John LaFarge are credited with developing this new type of glass around 1880. (See http://cindysglassworkdesigns.blogspot.com/2016/05/underground-stained-glass_15.html) More research on the rondels (round glass pieces in most of the windows), however, revealed that they probably came from Italy. Evidently, the Italians were the only ones who were making such round glass decorative pieces when these windows were made for the original church in 1900. Of particular interest is the distinctive raised punty (pontil) mark in the center of each rondel that proves they were each hand made from hot glass. Because the sashes for the old windows were rotten, new custom sashes had to be constructed. Bill Oliver with North Florida Millwork worked in coordination with Chuck Ale to construct the new framework from wood or composite for each window including the rose (round shaped) windows and the spandrel (fan shaped) windows. As each stained glass window was completed, it was installed in its newly constructed sash and held in place by wooden stops. Horizontal pieces of rebar were installed in each window to help insure stability and durability for the future. After a year and a half of work, all twenty-four windows were finally completed. Wooden boxes were made to protect the windows during their truck shipment back to Tifton. Chuck Ale oversaw the installation of the renovated windows along with Jim Lambert who was the general contractor for the entire Tifton Museum of Arts and Heritage renovation. It was the crowning moment of a fabulously beautiful renovation! The final touch to the installation was a brass plaque mounted on the wall beside each stained glass window. Each plaque denotes the name of an honoree and the donor who gave in memory or in honor of that person. 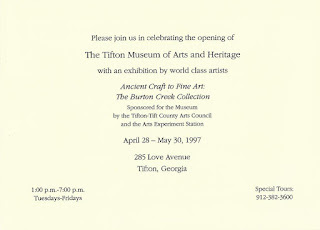 Since 1997, many more exhibits and events have been held in the Tifton Museum of Arts and Heritage. A very active and involved Museum Board and Art Guild have brought a continual flow of art and events to the museum. We have enjoyed such diverse exhibits as “Works by Andy Warhol: The Cochran Collection;” an Annette Rigdon Swan family exhibit of paintings called “All in the Family;” a Tibetan monk photo exhibit called “Tibet: Magical Land of Spiritual Wonders” which included a week long live demonstration of the creation of a 5’ x 5’ sand mandala painting by eight monks; an exhibit of local artists and their students “An Artist’s Passion Passed On: Teacher to Student to Peer”; and a solo exhibition by former local artist who now lives in France, Kippy Hammond, “Foreign Influences.” In addition to art exhibitions, the museum is often used as a venue for weddings, wedding receptions, meetings, and intimate musical and speaking performances. Completely renovated stained glass window. All of the exhibits that have been held in the Tifton Museum of Arts and Heritage have been exceptional. The Museum Board’s five-plus years of hard work has paid off hundred-fold. 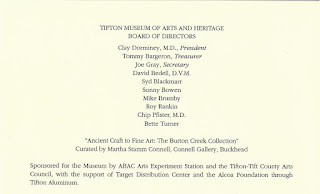 They successfully accomplished their vision and purpose for the renovation: “to build partnerships to benefit the entire community by firmly anchoring Tifton’s cultural district, to celebrate local and regional heritage and to present fine exhibits on loan from museums and institutions of national stature” (“Museum of Arts and Heritage Opens,” South Georgia Business Journal, Nov/Dec 1997, page 14). 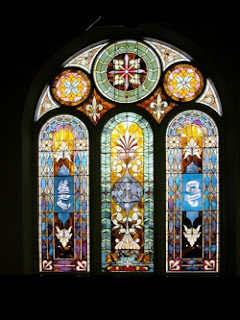 One of the most remarkable parts of any show or event at the Tifton Museum of Arts and Heritage will always be the twenty-four magnificent stained glass windows with their own amazing history. You just have to open the “cover” of this plain red brick building to discover the magnificent treasure of art and history it holds inside. 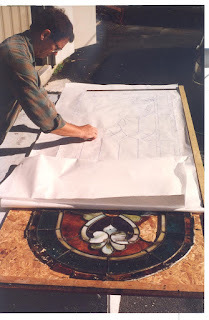 Interview with Chuck Ale, Florida Stained Glass, Tallahassee, Florida. May 25, 2016. Interview with Syd Blackmarr, Tifton Museum of Arts and Heritage Board member, May 2, 2016 and June 25, 2016. Interview with Roy Rankin, Rankin and Associates Architects, Tifton, Georgia. May 27, 2016 and June 9, 2016. “Living in a Landmark: A Guide to Tifton’s Historic Buildings and Districts,” Tifton Museum of Arts and Heritage. www.tifton.net. 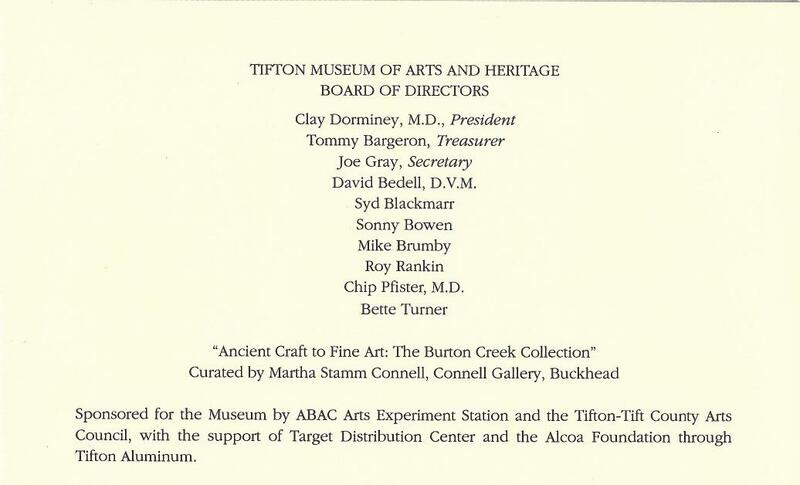 “Museum of Arts and Heritage Opens,” South Georgia Business Journal, Nov/Dec 1997. 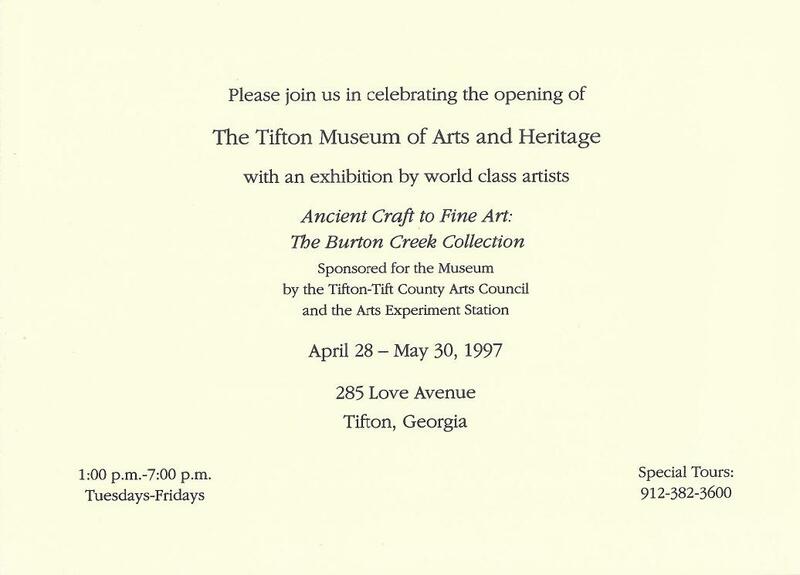 “Museum opening expected in early ’97,” The Tifton Gazette. Wednesday, November 27, 1996. Section A, page 1. “Renovating history in Tifton,” The Tifton Gazette. Wednesday, June 5, 1996. Section C, page 1. Cindy! This is fascinating! I’m so grateful for your detailed account of the restoration!